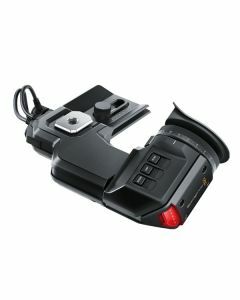 The Blackmagic URSA Viewfinder is intentionally designed for use with the URSA and URSA mini digital film cameras. It delivers a high-resolution 1920 x 1080 colour OLED display, precision glass optics, and an adjustable diopter to fine tune to suit your vision. It also includes a native digital focus chart to assist with subject focusing. The viewfinder utilises a built-in sensor that only activates the screen when the user is looking through it; to boost the longevity of the OLED screen. The Viewfinder screws directly onto the top of a URSA camera and is adjustable, so it can be used with the left or the right eye. The Blackmagic URSA Viewfinder should be compulsory for extensive over the shoulder or tripod shooting outdoors. Its high resolution 1920 x 1080 colour display provides exceptionally accurate focus and the screen is so sharp that it’s impossible to see individual pixels - it’s just like using an optical viewfinder on a traditional film camera. Simply plug it into the power and SDI viewfinder output, then start shooting.